The tuber of perennial herbaceous plant Bletilla striata (Thunb. ) Reichb. f. of family Orchidaceae. Guizhou, Sichuan, Hunan provinces in China. 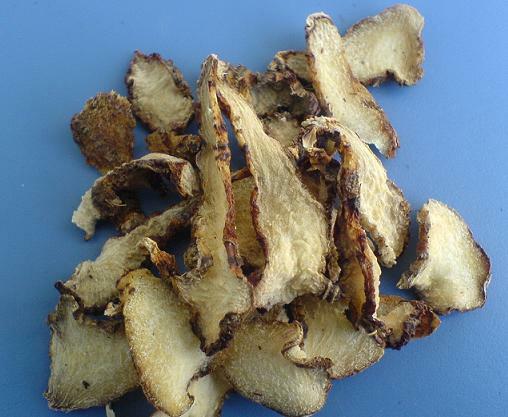 Removed fibrous roots, washed, boiled until white cord disappeared, peeled and dried in the sun; sliced and unprocessed. Bitter, sweet, stringe, astringe, light cold; lung, stomach and liver meridians entered. Astringe and stop bleeding, resolve swelling, promote tissue regeneration. This herb is sticky in texture and astringe in flavor as an essential herb to astringe and stop bleeding. It is indicated for external and internal bleeding. It mainly enters lung and stomach meridians, so it is mostly used in the syndrome of lung and stomach bleeding. For bleeding due to traumatic injury, its powder is used singly or mixed with water for external application. It is used alone or with San Qi to achieve better action of stopping bleeding. For hemoptysis, it is combined with herbs that can clear lung and descend adverse qi. For instance it is combined with Pi Pa Ye in Bai Ji Pi Pa Wan from Zheng Zhi Zhun Sheng. For hematemesis due to blood heat, it is combined with herbs that can clear heat and cool blood and hemostatics. For instance it is combined with Qian Cao, Sheng Di and Mu Dan Pi etc. in Bai Ji Tang from Gu Jin Yi Che (Ancient and Modern Complete Medical Book). For traumatic hemorrhage, its powder is applied on the wound singly or mixed with water. This herb is light cold and bitter with action of purging. So it can resolve and dissipate carbuncle and swelling. Because of its astringent flavor and sticky texture, it can heal wound and promote tissue regeneration. It works as a commonly used herb for treating external abscess by resolving swelling and promoting tissue regeneration. It is indicated for sore and abscess whether it is ulcerated or not. For the first stage of sore and abscess, it is used alone externally or combined with other toxicity-relieving and swelling-resolving herbs. For instance it is combined with Zao Jiao Ci and Ru Xiang, etc. in Nei Xiao San from Wai Ke Zheng Zong (Orthodox Manual of External Medicine). For ulcerated sore and abscess that is not healed for a long time, it is combined with damp-resolving and wound-healing herbs. For instance it is mixed with Qing Fen and Wu Bei Zi, and made powder applied exteranlly in Sheng Ji Gan Nong San from Zheng Zhi Zhun Sheng. For rhagades of hands and feet, it is made powder and mixed with sesame oil externally applied by promoting wound healing. For scald caused by hot water and fire, it is made powder or ointment applied externally with Bai Ji powder, calcined Shi Gao powder and vaseline to promote tissue regeneration and form scab. Decoct 3~10 g, at most 30 g. Make pill or powder, 2~5 g. Proper dose for external application. It shouldn't be used with Wu Tou (eighteen antagonisms).